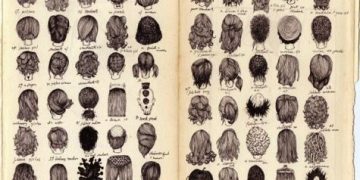 Almost every hairstyle requires styling with a specific brush or comb. Lets browse what kind of brushes and combs are there on the market and what are they used for. This brush is mostly used to create volume near the roots and to style hair while blow drying. It can also be used to create waves and to straighten hair. Metallic base gets hot from blow dryer and styles hair. It is only useless if you have really short hairstyle. For all other lengths this brush is a must have. It differs from the one above by the material it is made from. Ceramic base is softer on hair and is recommended for styling damaged or thin hair. 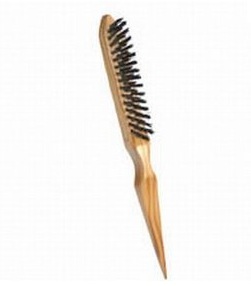 Round bristle brush is used to style hair the same way as two mentioned above. 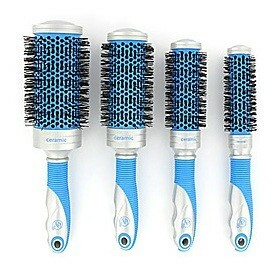 The difference is that while styling bristles also smooth hair, prevent split ends and they are soft for scalp. This kind of brushes are used in multy brush hair styling (with 6-8 brushes on the head at the same time) that creates perfect volume because brush is easy to fix in the hair and it holds. Buy it if you have middle length hair. It is useless for short hair. If you have long hair you can use it to create volume near the roots. It is a classic looking brush with bristles. As I already told above bristles are good if you have sensitive scalp and weak hair, hair ends that tend to split. Bristles also prevent hair electrization. Use this brush if you have long hair to simply brush them, also it is used to create sleek hair styles (sleek ponytail) and to create more body on curly hair (check video below). It is also perfect for children’s hair because soft bristles do not damage sensitive scalp. 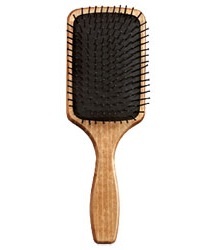 Mixed Bristle Brush is ideal brush for all hair types. 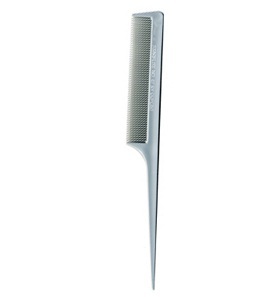 Bristles tenderly massage scalp and leave hair smooth and shiny, prevents electrization. Plastic or nylon bristles perfectly brush tangled hair. Can be used for all hair length. This is a classic brush for all hair length accept short ones. 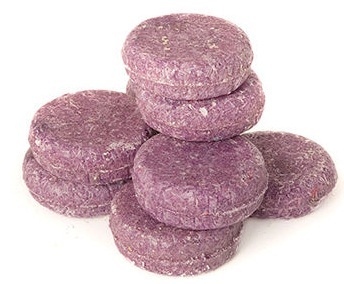 It is used to brush hair and massage scalp. Be sure that every little plastic bristle finishes with a tiny ball – it guaranties brush will not scratch your scalp. Can be used for all hair types. Thin hair tend to electrization and they are fragile, the best choice for them is natural bristle brushes as they remove electrization and do not damage hair structure. Right hair comb or brush can solve your problems with hair. Every brush and comb should be washed weekly with warm soapy water. It is especially important for oily hair and scalp type as grease stays on bristles while combing. This small brush is used to tease hair. Generally it only depends on your personal preferences which brush or comb to use for teasing. But bristles are softer on hair. 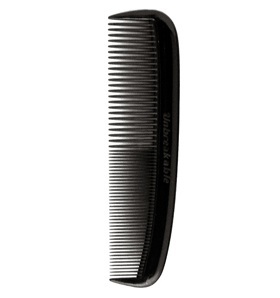 This is a basic pocket comb. You can use it to simply brush your hair, create parting, make a ponytail and other simple smooth hairstyles. 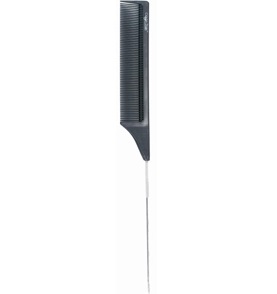 If your hair is thin or tend to electrization choose handle comb made from wood, carbon or silicone. This one is vital for curly hair, widely spaced pins comb curls easily. It is also very comfortable to brush long hair. 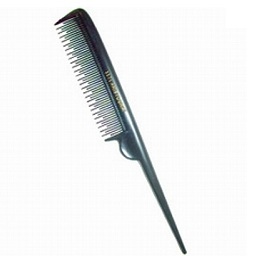 This comb is used by hairstylists for highlighting. With the metal tip stylist grab small hair strands for coloring. You can also use it for perfect parting and teasing. 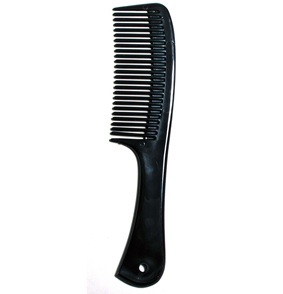 Simplest comb is used not only by men, hair stylists perform hair cuts with this kind of comb as well. You can use it to simply brush your hair, create a parting, pony tail, etc. Choose which one is more comfortable to use for you – Men’s pocket comb or Handle Comb. Every girl should have one. With this comb you can create perfect parting, make smooth hair styles, tease hair, brush small hair stands for straightening. 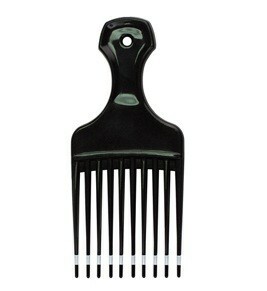 Very handy and easy to use comb. 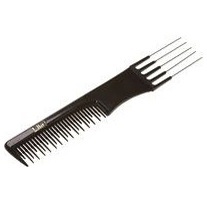 This comb is specially made for lifeless dry hair. Infused oil provides nutrition for hair and scalp, smooths hair. Hair does not get too much oil on so it stays light and not greasy looking. These two are professional teasing combs. 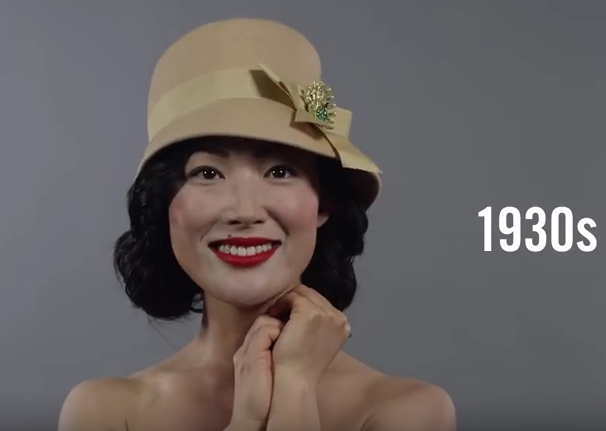 If you like big hair – you should use them. Different style of pins make hair strands separating and parting easy. Check out videos for instructions how to make big hair.